There are things I remember always wanting. That white lace dress. That Thumbelina doll. 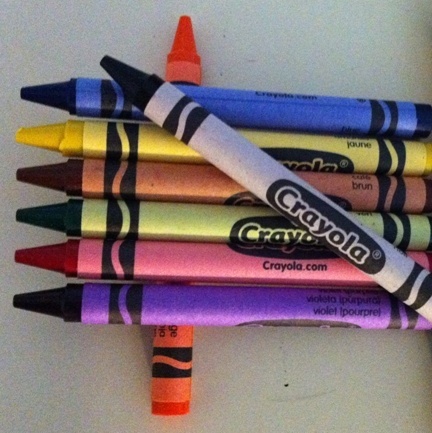 A 64 pack of Crayola crayons. Didn’t need. Wouldn’t ever get. We couldn’t afford something so unnecessary. They were too decadent. Who would ever need more than the basic eight colours – red, yellow, green, blue, brown, black, orange and purple! Blue for the sky. Green for the grass. Brown for the forest (I couldn’t see the forest for the trees). Yellow for the sun. Red for sunsets and fires and roses. Purple for grapes and lilacs. Orange for oranges and sunrises. Black for endless, starless night. Black, also, to make crayon etchings aka scratch drawings. We learnt this art technique early (Kindergarten, Grade 1). What you do is fill a piece of white paper with crayon – colour, shapes and patterns, making sure to press hard. It is best to use light colours at this stage. Once you have filled the paper with colour and different crayon patterns, colour heavily over the whole paper using black crayon. Plan out a picture or design and using something sharp like a paper clip, scratch designs into the black crayon. The light colors will show through where you scrape away the black. 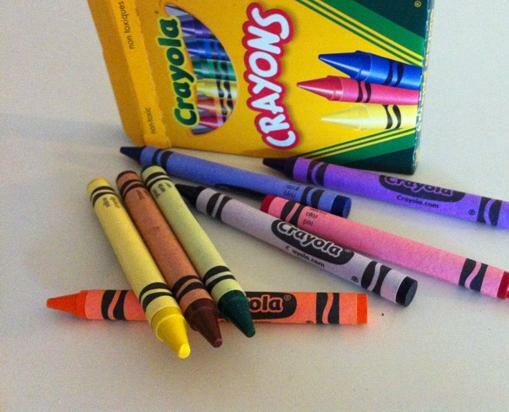 I keep buying Crayola wax crayons and giving them away. I actually bought this tin when it first came out. I no longer have it. Mostly likely it went to my nieces and nephews. I always feel so guilty. Like I don’t deserve a large pack of crayons because I’ll never use them. I don’t have enough time or paper or talent to justify the expense. There are too many colours. I mean, really, how many reds does one need – raspberry red, blood red, rose red, rust red, burgundy, crimson, ruby, scarlet? I mean, how many shades of colour can their be out there? What is the difference between blood red and crimson? I have no talent for visual representation. That is not the sort of artist I am. I create art with words or at least, I try to. I need. I want the wax crayons just for fun. I want to sit at a table randomly selecting colours and draw circle, lines and spirals. I want to lose myself in the experience until I am one with the colour. I want to lose myself until all I can see is the colour. A sea of blue. A silver sky. A wheat field of gold. Red blood cursing through my veins. An endless black and starless night.